Vehicle Auxiliary Power Supply (VAPS) | Strobes & Beacons | Adams Industries, Inc.
Phoenix and Pegasus beacons are normally powered by a common 9 volt battery (BA-3090) that must be replaced every so often. In place of the battery, the VAPS power supply converts current from any DC source ranging from 10 to 35 Volts to power the Phoenix and Pegasus beacon. Attached to a vehicle battery, the Phoenix / Pegasus beacon will operate for essentially an indefinite period. 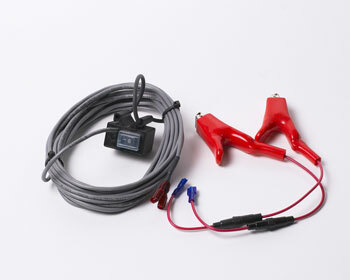 The VAPS system is comprised of the beacon mount with ON/OFF switch, 20 foot power cable, fused vehicle battery clips, and bungee cord for securing the beacon mount. The VAPS system includes automatic sur ge protection and current sensing as part of its function ensuring that the attached beacon is protected from power shorts and surges. The system is also polarity independent so it can not be wrongly connected to a power source. Operating Climate The VAPS system has been engineered for use with military land vehicles.